Seritage Growth Properties is an established developer and owner/operator of retail spaces whose portfolio includes 40 million+ square feet of building space across 49 states and Puerto Rico. The brand exhibits at RECon (the Global Retail Real Estate Convention) to reinforce its Industry leadership and meet with existing and potential partners. Seritage aimed to upgrade its custom booth with high-tech, forward-thinking embellishments while remaining mindful of cost. The revived exhibit would increase visibility and offer partners a renewed sense of excitement and confidence about the brand. 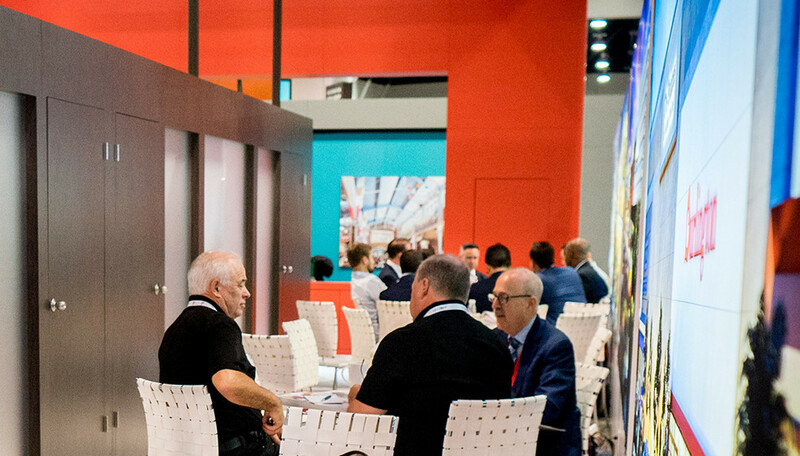 Freeman and Seritage reviewed the previous year’s booth to determine what worked, what needed changing, and what could be elevated to create buzz using the existing structure as a foundation. 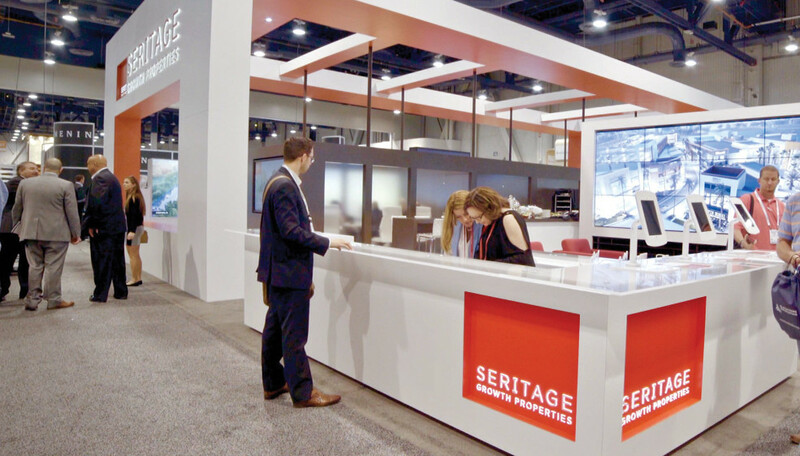 Through collaborations on the custom exhibit and other events, Seritage understood our capabilities — including audio visual know-how and what could be accomplished by putting ideas and expertise together. After Seritage presented thoughts for a lighted logo and monitor wall sketched on a napkin, the teams went to work to bring the brand’s vision to life. 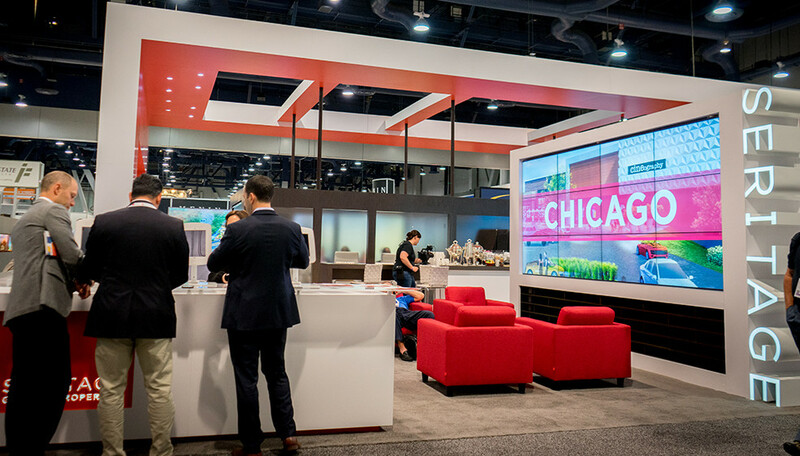 The architectural 50’ x 60’ booth already achieved a formidable presence, but new upgrades took the brand to new, high-tech heights. A dynamic AV wall surrounded the perimeter — large flat screens featuring Seritage property footage gave the space movement and energy. Behind reception, an 8’ x 4’ interactive LED wall enticed visitors to scroll through property information. Repurposed from a smaller booth, the vertical Seritage logo was revitalized with intricate lighting to illuminate the space. Previously separated by fully-frosted Plexiglas, the meeting rooms were modified to be more welcoming. The opaqueness was customized with a smoky gradient to achieve an open and appealing look while still providing privacy. Seritage understands the importance of valuable property and maximizing space to make an impact. 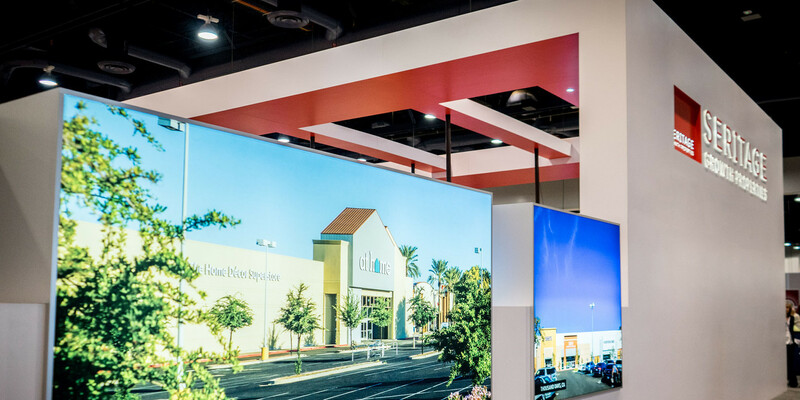 Upgrading its existing structure to augment efficiency while also investing in the right enhancements helped the brand invigorate its presence at RECon. After this successful show, Seritage has added a new region to its show schedule and plans to grow market share with this booth in multiple configurations. As a new company, we are trying to rethink retail and not do the same old thing. You can see from our booth that we’re different. Everything about the design and fabrication is top notch.